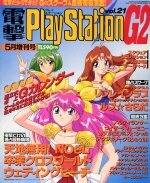 This issue contains a five page database of character voice data for recent PlayStation games. 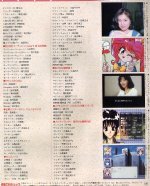 There are small photos of various seiyuu scattered on the five pages. 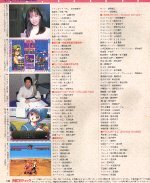 There is a two page color article on the game "Bloody Bride" (Imadoki no Vampire). 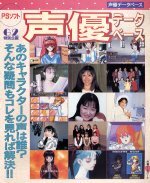 There is a group photo of the cast, and individual photos of the following six seiyuu: Yuuki Hiro (結城比呂), Touma Yumi (冬馬由美), Yamazaki Wakana (山崎和佳奈), Koyama Yuka (小山裕香), Hagimori Junko, and Inoue Kikuko (井上喜久子). There is a short report on a recent Tokimeki Memorial event. Photos of Kuribayashi Mie and Kingetsu Mami (金月真美).